When does someone have the right to an attorney in a Michigan DUI case? In Michigan, the courts afford virtually no right to counsel during the investigative and evidence-gathering stages of a criminal proceeding. These moments would take place on the side of the road, and back at the police station when giving a chemical test sample. As a general rule, the Sixth Amendment right to counsel attaches only when the accused has been formally charged at arraignment or indictment. A notable exception arises in the case of custodial interrogations where the accused is afforded a right to counsel to protect his or her Fifth Amendment privilege against self-incrimination. After the commencement of formal charges, the right to counsel is afforded at “critical” stages of the criminal proceedings. This means in the rare circumstance where the police stick you in an interrogation room as part of your DUI arrest, you'd have the right to an attorney. 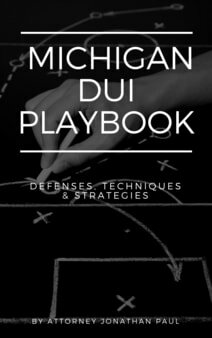 In general, the right to counsel in a Michigan DUI case is very limited. No right to counsel exists during pre-arrest roadside questioning of a suspected drunk driver. Similarly, there is no right to counsel during a routine booking procedure, even if it is recorded on video, or during physical sobriety tests following the booking. More significantly, under Michigan state law, an arrested drunk driver has no right to counsel during a breath test examination.